Hey, do you like the Frosty's at Wendys? 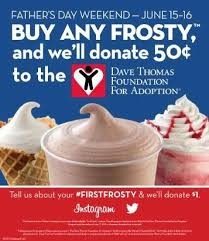 This Saturday and Sunday, the Dave Thomas Foundation for Adoption is donating $.50 for every Frosty bought. So take the family in and cool down with a tasty Frosty! 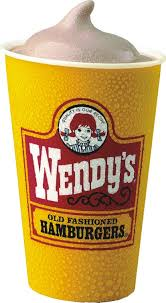 I have a $5 gift card for someone out there to enjoy from Wendys. Just leave a comment and I'll pick a winner in a few days. Make sure you leave an email address so I know where to contact you.